Evaluate and make strategic decisions that drive results. 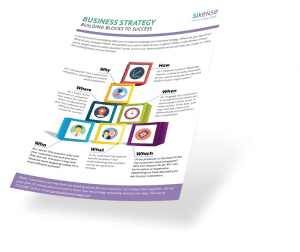 Start designing a successful, sustainable business strategy right now. Start by knowing where you want to go. Strategy is part science and part magic. It’s fluency in business and people. I think it’s thrilling and fun to work side by side with you while diving in fearlessly to identify and make the changes needed to hit your critical business targets. You will gain more focus, clarity, direction and confidence to succeed in the long run with the help of my empathy-based approach, the Sixense Empathy Model™, other business tools and decades of experience. I customize my approach and the frameworks to your unique business needs. What’s the first best thing you should do right now? That’s the simple question every founder, owner, or business-builder should ask themselves to avoid overwhelm and an impossible to-do list. The answer is your Sixense Scan. Chart a roadmap for your success by understand your baseline with the help of an expert. It all starts with the simplest commitment of all – an easy and free conversation about you.